A company has to organize itself properly in order to implement its objectives (values and mission). A famous model that addresses such issue is the 7-S framework suggested by McKinsey, well-known in the business world. According to such model, all the 7-S (Shared Value, Strategy, Structure, System, Style, Staff and Skills) must be aligned in a way that is consistent in order to be effective. Organization is not only about Structure (see ). Let’s see how the 7-S framework might be applied to EU (comments coming from experts in business and law are more than welcome). The EU doesn’t have a constitution that formally define itself as a country. However, the values shared among the members of EU are stated in the article 2 and article 3. In particular, “The Union is founded on the values of respect for human dignity, freedom, democracy, equality, the rule of law and respect for human rights, including the rights of persons belonging to minorities” while the aims of the EU are 1) to promote peace, 2) offer to each citizen an area of freedom, security as well as ensuring free movement of people and 3) establish an internal market based on balanced economic growth aiming full employment and social progress. (see ). Is it reasonable to consider the principles stated above as Shared Values? For a company, a strategy is the definition of a plan for the implementation of its values and objectives. What about EU? During last decades, the EU promoted the enlargement program (see ) in order to help countries in the Central East Europe to join the Community while last year (2012) the members signed the fiscal compact where it was agreed a reduction plan of the public debt in order to face the economic crisis. Should the EU enlargement program and the fiscal compact be considered as part of the Strategy of EU? In a company the structure is related to its organization and governance. For a country in general, government, parliament, banks, unions and other institution might be considered as a part of the structure of a state. Regarding EU, there are the European Parliament, Council, Commission and the European Central Bank. In a company, the System is everything that defines policies and formalizes procedures. Thus, does it make sense to consider as part of system for a country all the laws, the regulations and the policies? Regarding EU, its system is defined in the Treaty on the Functioning of the European Union (TFEU). An example, is the article 294 of the TFEU that defines the ordinary legislative procedure. The Style of the company is about people and in particular the managerial style adopted by the governance. There are many models that define the different styles of leadership (see ). Is it possible to assign a Style also for the institutions that lead the EU? If the Style is related to managers, the Staff is about employees. The Staff are the generic capabilities of the employees in a company in terms of soft skills, behaviors, habits and ritual that are strictly related to the culture. Since the employees that work for a company are also citizens the Staff of a country or an institution like EU might be defined as the culture or the cluster of cultures within its territory as well. 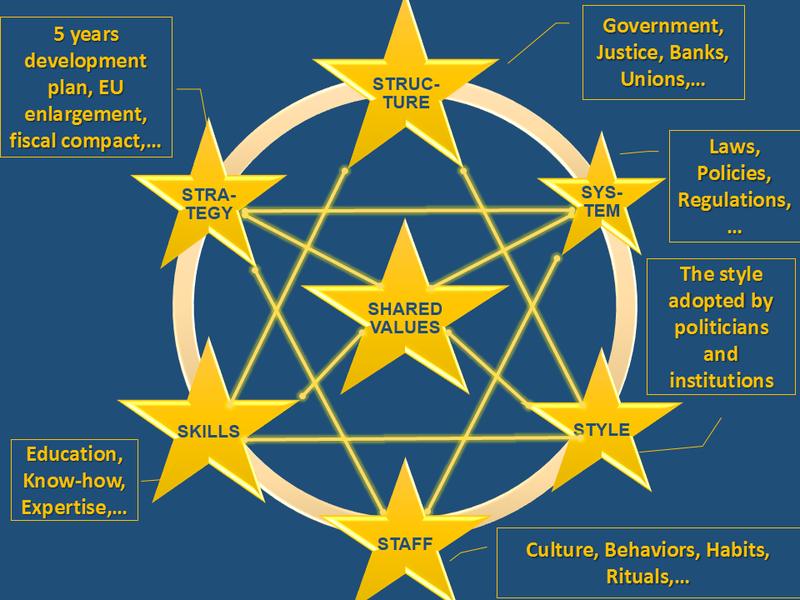 An example of how a culture should be described is given by the 6-dimensions model by Hotsfede (see ). The Skills are the actual competencies of the employees working for the company. Thus, what about consider the same capabilities of the citizens as set of Skills of a country and EU as well? What do you think? Is it possible to apply the 7-S framework aslo for insitutions such as the EU? If yes, within the 7-S framework, is the EU properly defined? Share you thoughts and feelings.